It's happened again! Sincerest form of flattery, etc., etc. Leaked pics of Acer's rumored Aspire 3951 "looks very familiar" (is a complete clone of) the refreshed MacBook Air, both inside and out. SSD, Sandy Bridge, light and thin. Acer's version is slightly thinner and slightly heavier than Apple's original, but only to an extent that an electronic scale will notice. Beyond dimensions, the entire industrial design has been copy and pasted. The aluminum frame—same shape. The wide, buttonless trackpad. The chiclet keyboard. The MacBook-y black hinge. Everyone wants a lean and light (and powerful!) 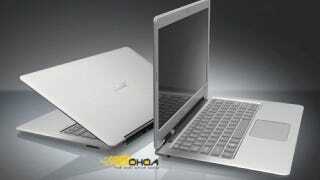 laptop, but it's clear Acer's trying to cash in on Cupertino's design prowess. It certainly wouldn't be the first time someone's tried it. Samsung&apos;s Self-Proclaimed "Notebook Masterpiece" Seems More Like "MacBook Clone"